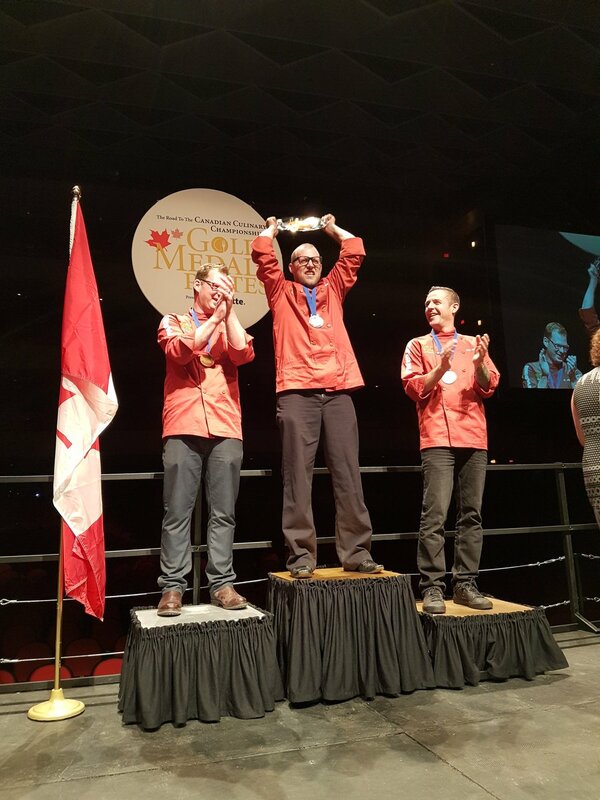 With Halifax under our belt (in every sense) the Gold Medal Plates Flying Circus headed off pronto for the prairies. Those of us on the early flight (5:20 a.m.) out of Halifax were smug in the knowledge that we would arrive in good time but alas, Regina was socked in and the plane was diverted to Saskatoon for refuelling. But we made it in time and I’m so glad we did! It was a mighty shindig, with the excellent Catriona Le May Doan taking over as emcee, inspiring words from a host of athletes and brisk bidding on all our trips. The energy of the evening just seemed to grow and the sold-out crowd turned it into a wonderful party, dancing in the aisles to fabulous music from Jim Cuddy and Ed Robertson (their banter growing more and more hilarious) and Barney Bentall, with Anne Lindsay, Devin Cuddy and Sam Polley sharing the stage. The chefs were in splendid form and every dish brought beautifully imaginative ideas and exceptionally polished visual presentations. Finding medallists called for serious concentration from the judges – a most professional crew led by our Senior Judge for Regina, author, photographer, broadcaster and journalist C J Katz, together with Executive Chef of the Regina Legislature and captain of the Saskatchewan Culinary Team at the 2000 Culinary Olympics in Germany, Trent Brears; chef and educator Thomas Rush; writer, blogger, restaurant columnist and television producer Aidan Morgan; and last year’s gold medallist, Chef Jonathan Thauberger of Crave Kitchen & Wine Bar. Here’s how it went down, podium-wise. Joel Williams of The Capitol Restaurant & Cocktail Bar won bronze. He made a delectable terrine of juicy, tender rabbit meat held together by a trembling matrix of jellied stock and spiked with just a hint of star anise and cardamom. 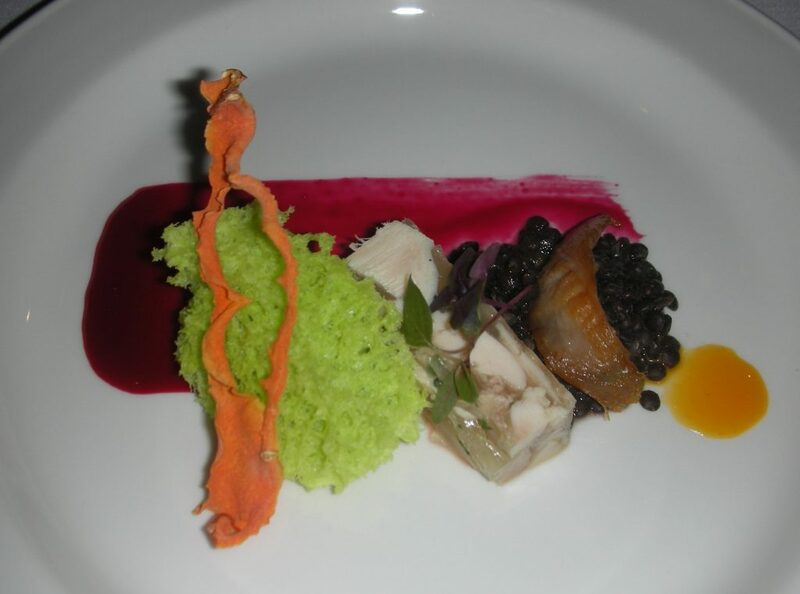 He also cured rabbit bacon and laid a tiny rasher of it across a mound of black beluga lentils, moistening them with a tableside spoonful of rabbit jus. What looked like a green sponge turned out to be ethereally light, crustless brioche coloured with spinach – perfect for mopping up the sweetish raspberry beet gastrique that Chef had painted across the plate – and the spoonful of tangy sea buckthorn sauce that added acidity to the delicate dish. Adding more dramatic colour was a crisp tuile of dehydrated carrot and a final garnish of red amaranth and purple basil sproutlings. It was a suave and clever creation full of pure, soft-spoken flavours and well matched by an impressive Pinot Noir out of B.C.’s Similkameen Valley, the Eau Vivre Winery 2014 Pinot Noir VQA. Curtis Toth of DoubleTree by Hilton won the silver, though he was only 1.5% away from the gold. His dish was an exquisite triptych of chinook salmon, the three elements arranged along a broad stripe of cultured cream seasoned with salt and pepper, citrus and the faintest bitter hint of cumin. On the left was a bite-sized slice of silky salmon, virtually a crudo though it had been cured for a moment in citrus-infused gin. Chef crowned it with a fragment of a crispy ochre-coloured cracker made from fermented lentil flour; as delicate as lace, it crumbled to the touch. The middle component was even daintier – a dab of sapid mousse made with lightly applewood-smoked salmon sandwiched between two tiny, crispy black nets made of a lattice tuille dyed with squid ink.The third part of the dish was a small piece of cured, candied and hot-smoked salmon – a nice contrast of texture. 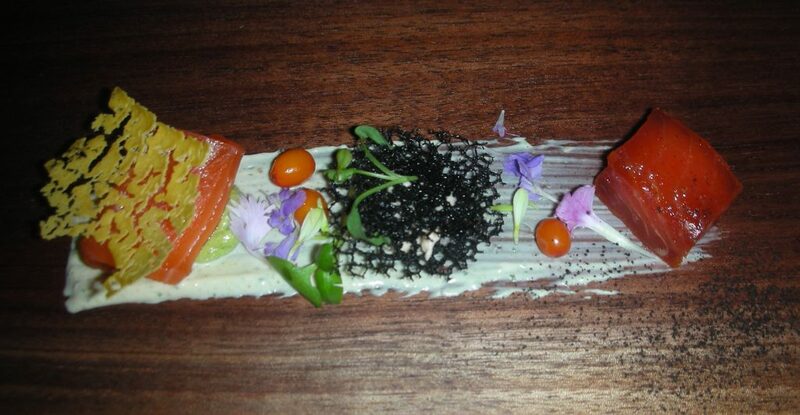 Chef finished the dish with a scattering of sea buckthorn berries, purple flower petals, and a black powder made from charred leek. So refined, so dainty, but the flavours had their own quiet power! 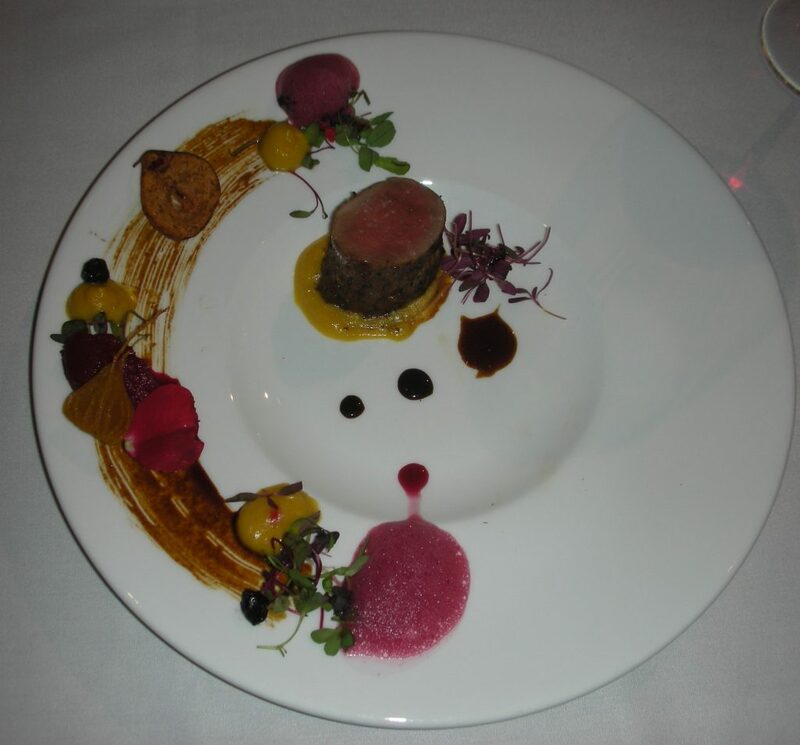 The wine Chef chose was Vintage Ink Wild White 2014 from Niagara, a round, off-dry blend of Viognier and Riesling that came to life in the dish’s company. When I announced our gold medallist from the stage, the entire audience cheered and rose to their feet, delighted with the judges’ decision and with a dish that would certainly have won “people’s favourite” if we were ever to offer such a trophy at a regional event. Garrett “Rusty” Thienes is chef of Harvest Eatery and Fresh Market in Shaunavon, a very small town three-and-a-half hours west of Regina and not far rom the Montana border. He worked with a wild boar tenderloin from Wild Rose Farms, giving the amazingly tender meat a 90-minute cold smoke with applewood and crusting it with a dry marinade of crumbled local morels and sage. Everyone got a cylindrical drum of the meat which was held in place on the plate by a cushion of earthily sweet butternut squash velouté. Dabs of the velouté reappeared on the broad rim of the plate together with the other components of the dish – a quenelle of tangy purple beet purée; some mounds of mauve foam made of saskatoonberry “air;” a dehydrated pear chip spiced with coconut, clove, nutmeg and cinnamon; half a baby golden beet poached in pear juice; and a black garlic demiglace that brought richness and fragrance to the plate. Petals and sproutlings prettied everything up but the real beauty lay in the harmonious relevance of all the elements, in tune with each other, with the meat and with the wine. This was the best match of the evening (and the extra points Chef won in this category took him to the top) – the 2014 Pinot Noir from Dirty Laundry vineyards in the Okanagan. A resounding bravo to all the chefs who competed, five of them newcomers to Gold Medal Plates competition and full of promise for the future. Chef Thienes will be coming to Kelowna next February. Meanwhile the entire GMP gang of musicians, athletes, culinary and wine advisors, production team – even our star auctioneer, Bill Brown, boarded a bus the morning after our Regina evening and drove away into the prairies, to do it all again tonight in Saskatoon.